On March 30 and 31, Borderline will collaborate with Rocky and Jack from Pun Pun Organic Farm, organizing a workshop on the Fermentation process that is used in so many foods we eat. This will be the second workshop on fermentation. Places are limited. 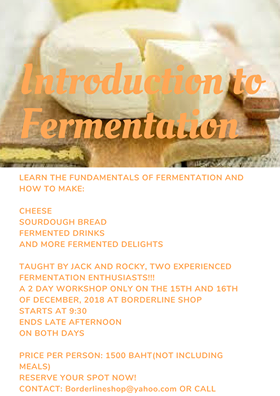 Rocky and Jack will show you how to start a sourdough, how to turn milk into cheese or yoghurt and how Kombucha and Kimchi are made. An extra element of a workshop on this scale is that the ways people have learned how to preserve and enrich food is identical wherever people have lived. The workshop takes place on a weekend and last two days. In order to allow all participants to take full advantage of the workshop, places are restricted so if you want to join, contact us early. Come to Borderline, send an email or make a phone call.